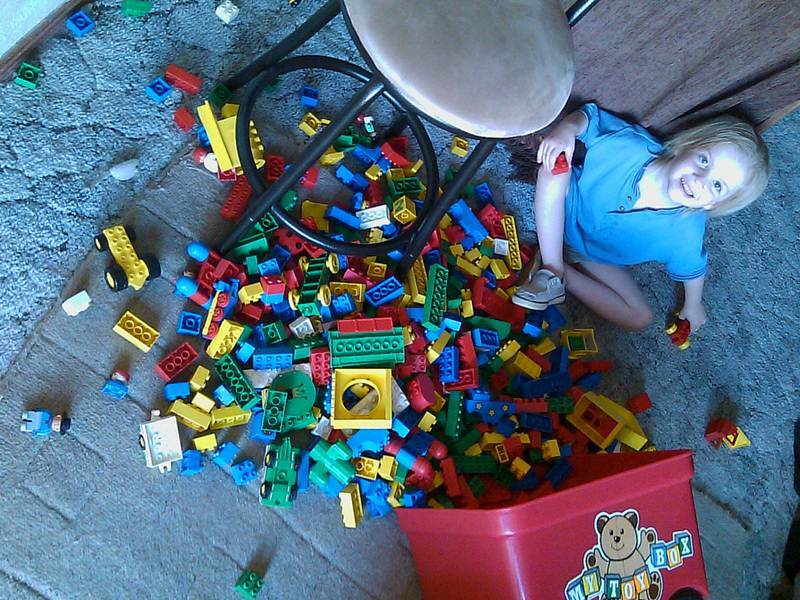 After the winter holidays, it's a sure bet that toys underfoot will become a problem. From little LEGOs to blocks to crayons to puzzle pieces to dolls and more, rouge toys get in the way, trip families up and cause general mayhem. However, it doesn't have to be this way. The right sustainable toy storage solution can keep your home tidier and help encourage kiddos to pick up after themselves. 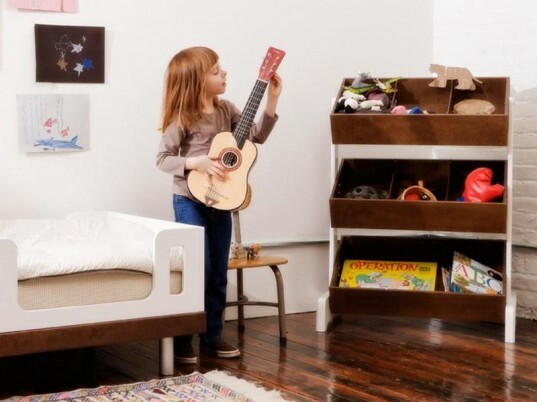 See some of our favorite eco-friendly toy storage solutions below. We’ve been Mod Mom Furniture fans for a long time, and there’s no doubt that Mod Mom offers some of the most useful, not to mention, adorable toy storage solutions around. For instance, the Maude Toy Box, which is large enough to hold toys galore plus features an open air book cubby. Made with heirloom quality with sustainable Baltic Birch Ply and mortise and tenon joints, along with eco-friendly, low-VOC, Eco-Var finish. Your choice of green or blue. While the Oeuf‘s Toy Store storage system is a bit pricey, you won’t find a better or longer-lasting storage solution. This organizational delight will grow with your child, maybe for life, adapting to your child’s functional needs as her toys and supplies change. Sustainably crafted with Baltic Birch plywood, environmentally friendly MDF made from recovered wood fibers, and a non-toxic, white water-based finish, the Toy Store is available in two color combos: classic walnut or birch finishes with white accents. The Multi-Box set is a sweet and affordable toy storage solution. 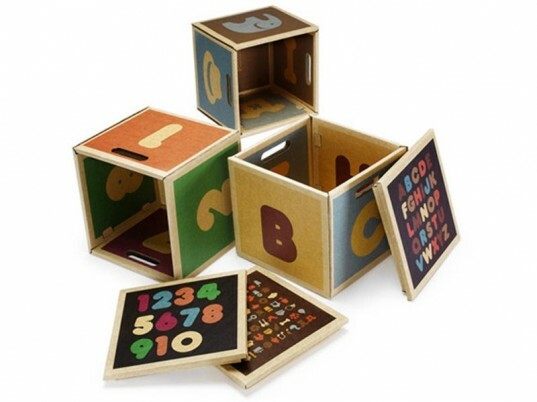 The set includes 3 cardboard boxes, each of which is a 3 in 1 combination of a storage box and a learning tool. Made entirely of corrugated cardboard these boxes are fully recylable and protected by a green and non-toxic fire retardant. You can fill them, stack them and store toys with ease, plus, the cute designs on each Multi-box can be used to teach your child about shapes, numbers and letters. The Nonjetable Bookcase Recto-verso is a lovely bookcase that won’t look out of place in your modern home. Made with whitened birch plywood with a secret artistic twist – the back panels are white surfaces that your child may draw on with felt-tip pens, then wipe clean with a cloth to start all over again. The bookcase is double sided, so it’ll work perfectly as storage and a great room divider for siblings. Beautiful enough to stand alone later on as an adult storage piece, this unit has tons of space and compartments for childrens’ smaller items as well. If you’re looking for a less costly solution that’s still modern and green check out the Nonjetable Suspended Bookcase. This Big Play Table doubles as a wonderful play surface for arts and crafts, train sets or Lego creations, plus contains handy storage solutions within. The set includes a Big Table Top and a 6 Pack of ViaBoxes, but you can customize this set with colorful fronts, doors, shelves, racks, and drawers as well. All ViaBoxes and accessories are made with baltic birch plywood that is sustainably grown and harvested along with eco-friendly paints and finishes that provide durable protection for the life of your unique storage set. This popular Land of Nod storage system is available in a wide range of color choices, enough to mix and match to any nursery or child’s space design scheme. Sitting like cute little vegetable bins, Storagepalooza works well as a practical toy, book and game storage unit and can be stacked three units high. Each bin is made of solid sustainable rubberwood with veneered back panel and low emission engineered wood. The units also come with felt pads to protect Storagepalooza underside and your floor. We've been Mod Mom Furniture fans for a long time, and there's no doubt that Mod Mom offers some of the most useful, not to mention, adorable toy storage solutions around. For instance, the Maude Toy Box, which is large enough to hold toys galore plus features an open air book cubby. Made with heirloom quality with sustainable Baltic Birch Ply and mortise and tenon joints, along with eco-friendly, low-VOC, Eco-Var finish. Your choice of green or blue. 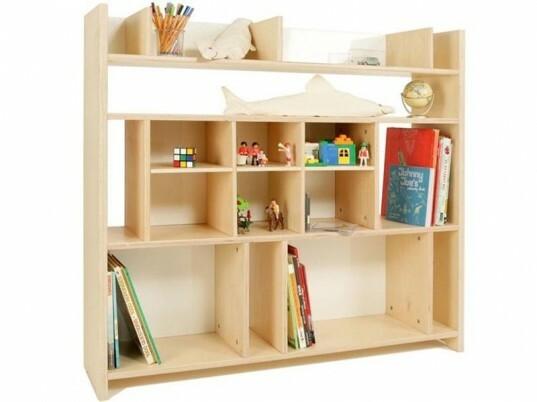 While the Oeuf‘s Toy Store storage system is a bit pricey, you won't find a better or longer-lasting storage solution. This organizational delight will grow with your child, maybe for life, adapting to your child's functional needs as her toys and supplies change. Sustainably crafted with Baltic Birch plywood, environmentally friendly MDF made from recovered wood fibers, and a non-toxic, white water-based finish, the Toy Store is available in two color combos: classic walnut or birch finishes with white accents. The Nonjetable Bookcase Recto-verso is a lovely bookcase that won't look out of place in your modern home. 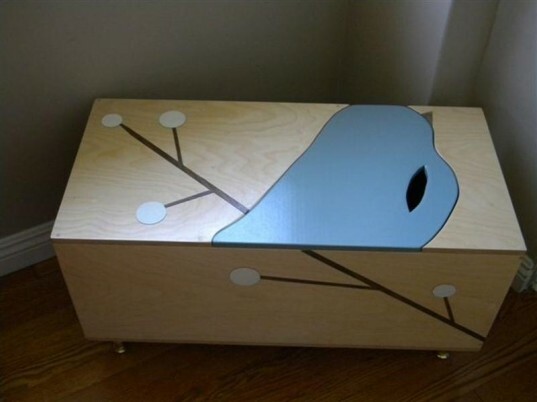 Made with whitened birch plywood with a secret artistic twist – the back panels are white surfaces that your child may draw on with felt-tip pens, then wipe clean with a cloth to start all over again. The bookcase is double sided, so it'll work perfectly as storage and a great room divider for siblings. Beautiful enough to stand alone later on as an adult storage piece, this unit has tons of space and compartments for childrens' smaller items as well. If you're looking for a less costly solution that's still modern and green check out the Nonjetable Suspended Bookcase. This popular Land of Nod storage system is available in a wide range of color choices, enough to mix and match to any nursery or child's space design scheme. Sitting like cute little vegetable bins, Storagepalooza works well as a practical toy, book and game storage unit and can be stacked three units high. Each bin is made of solid sustainable rubberwood with veneered back panel and low emission engineered wood. The units also come with felt pads to protect Storagepalooza underside and your floor.